A node-locked license allows using MDK by exactly one person on a maximum of two computers (single-user). No network connection required. A Floating-User License allows developers to use MDK on multiple computers. Floating-User Licenses require a file server hosting a license file. A network connection to check out the floating-user license is required. A FlexLM License allows developers to use MDK on multiple computers. A network connection to check out a FlexLM license is required. Note that hardware breakpoints are limited by the ARM Embedded ICE Hardware. The original ULINK has been replaced by ULINK2. 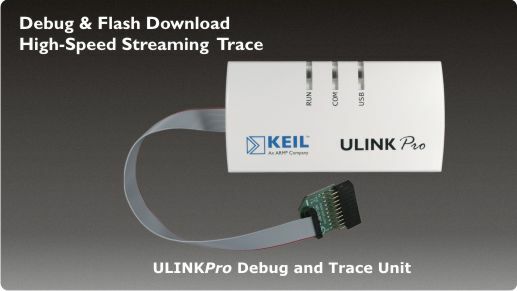 The Keil ULINKpro Debug and Trace Unit connects your PC's USB port to your target system (via a JTAG, Cortex Debug, or Cortex Debug+ETM connector). 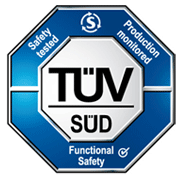 It allows you to program, debug, and analyze your applications using its unique streaming trace technology. 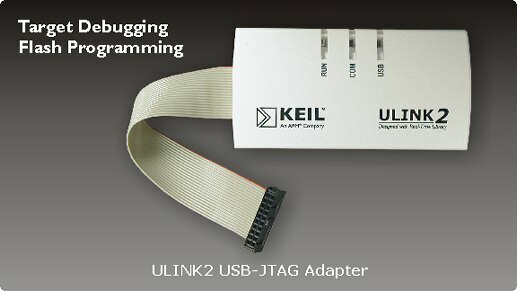 The Keil ULINK2 USB-JTAG Adapter connects your PC's USB port to your target system (via JTAG, SWD, or OCDS) and allows you to program and debug embedded programs on target hardware. 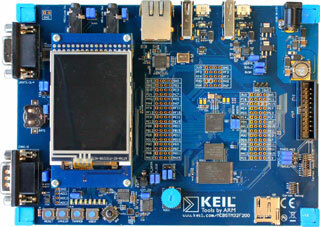 The Keil MCBSTM32F400 Evaluation Board enables you to create and test working programs based on the STMicroelectronics STM32 F4xx series of ARM Cortex™-M4 processor-based devices. 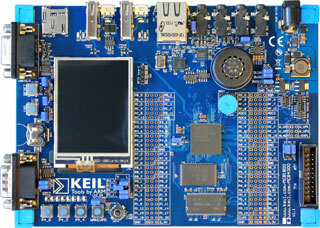 The Keil MCB4300 Evaluation Board enables you to create and test working programs based on the NXP LPC4300 family of ARM Cortex™-M4 processor-based devices. 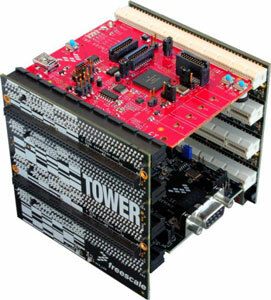 The Keil MCBTWRK60 Starter Kit features the Freescale Kinetis K60 Tower system, ULINK-ME Debug Adapter, and examples which enable you to create and test working programs based on the Kinetis devices.